When JCM's says, "stress free pet boarding." They really mean STRESS FREE pet boarding. 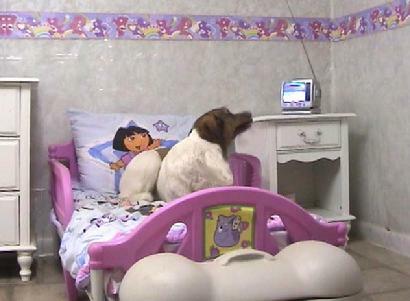 Even though doggie TV is important for that homelike feel, it's just as important for dogs to have the freedom to go in and out of their enclosure as they choose. This is just one of many extremely important features we provide. it doesn't have to be in deplorable conditions. 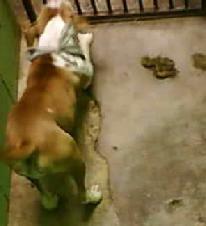 Dogs housed at any boarding facility need to be confined in one way or another. Indoor / outdoor runs and cages are the norm. However, it's the length of time the pet is confined that varies. 12 to 15 consecutive hours in any size enclosure is way too long, and just plain wrong. 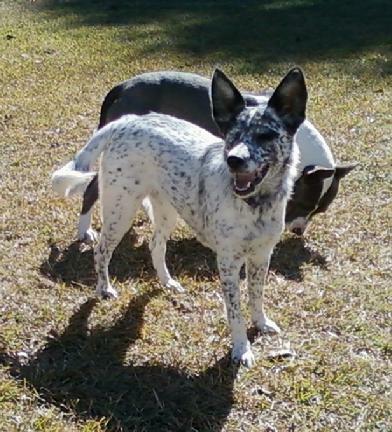 JCM's boarding kennel owners live on the property, and let their boarders out at frequent intervals around the clock. If a pet wakes up in the middle of the night, someone will always be there to comfort him. 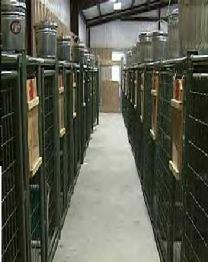 Most boarding kennels take the dogs out of their enclosures twice a day. The dogs are usually hand walked between 5 and 15 minutes depending on how many dogs there are. Difficult dogs may not be taken out at all. Many facilities have what's called a "drop through system." This is a grid that sits in the bottom of the cage. Waste material falls through onto newspaper which is then removed and replaced, without the pet ever being handled. Facilities with indoor runs may also use a drop through system. These runs have a drain beneath the grid where waste is hosed away. Even Pet Sitters have been known to bring drop through cages to their clients residence. In that way they don't have to care for the pet everyday. The unsuspecting or out of town owner still thinks their pet is getting walked at least twice a day and is paying for that service. Quite a few boarding places have sprung up since hurricane Katrina, and they all have a common theme; Rented Warehouses (zoned heavy industrial). Most of these are "franchises" and called "Doggie Daycare." Doggie Daycare dogs can run and play all day. However, dogs boarded overnight at these facilities are caged from 5:00 or 6:00 in the evening and are not let out until 7:00 or 8:00 the next day. That's 12 to15 hours. In addition, no one lives on the property. They charge an exorbitant amount of money and leave the pets unattended for hours while they go home at night. If a dog has to go out or gets sick, he is all alone. 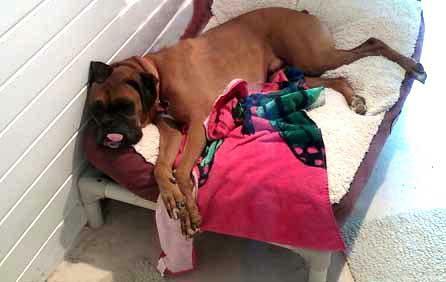 Kennels with indoor / outdoor runs only let the dogs into the outdoor portion twice a day. If the dog doesn't want to go, he gets a hose sprayed in his face. In addition, dogs kenneled in indoor / outdoor runs are confined to the dimensions of the run for the duration of their stay. 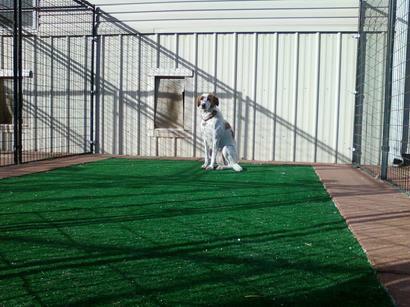 Some kennels provide a small exercise yard, but at an additional cost per use. 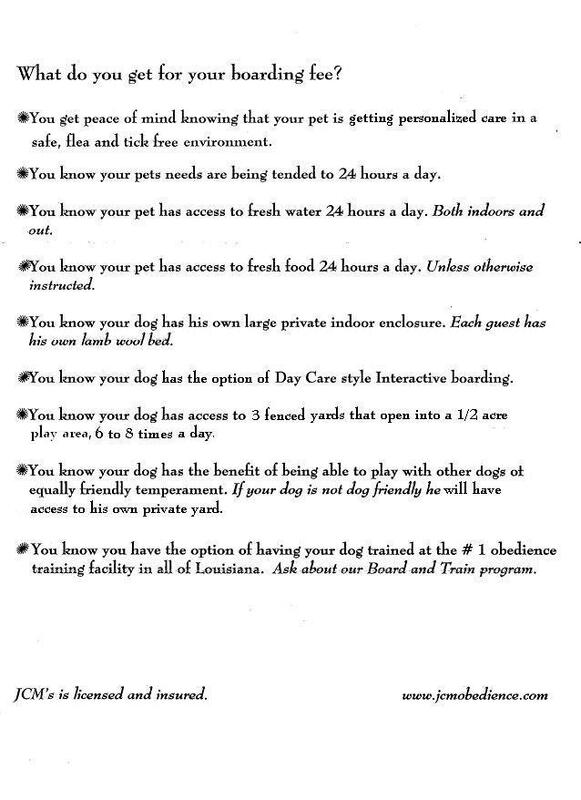 JCM's Pet Boarding Facility takes pride in the fact that their boarders are let out frequently around the clock. That their boarders are interacted with often. That geriatric dogs are never confined. That they maintain healthy housebreaking and bathroom habits for their guests, and don't charge extra for extra services and amenities. JCM's is a privately owned, family facility with the pets best interest at heart. They are not a generic, franchise type businesses with big company financial backing and cute, misleading names for their over priced standard runs or cages. JCM's doesn't turn pets away just because they are not spayed or neutered. They also live on site, so pets are tended to 24/7. Other facilities pale in comparison and leave a lot to be desired.